Baby Tub Gift Basket ... let's take a fun bath! A baby tub gift basket will provide lots of fun for mum, dad and baby - since bathtime is great fun. And with the right and stress-free equipment and once baby is used to that glorious element of water, bathtime will extend to endless hours of fun and pleasure! Ready-made and cute baby bath gift baskets are offered by many baby gift shops online. However, making one yourself is an easy project, done in no time and will be much more unique and personal! First, see my unbeatable tips and advice on newborn baby gift baskets in general and then come back here for the details on your baby bath theme. Choose a tub as the 'basket' of your baby bath gift. go for a good one, see the reviews on amazon or take one that has been recommended to you. If a good and functional tub is too expensive for your budget, rather go for a normal basket instead of buying a shabby tub just for the sake of it. Baby tubs need to fulfill certain functions and need to be safe as well as give parents peace of mind - and no hurting back, too! Whale of a Tub by Fisher Price. The original Tummy Tub bath tub also has good reviews and serves as a great basket. It's not that wide so you need not too much stuff to fill it up (you might use a thick towel or diapers to fill the bottom). Obviously you can include everything needed for and related to baby's bath in your baby tub gift basket. Design-wise related to bathing are fishes, frogs and ducks. 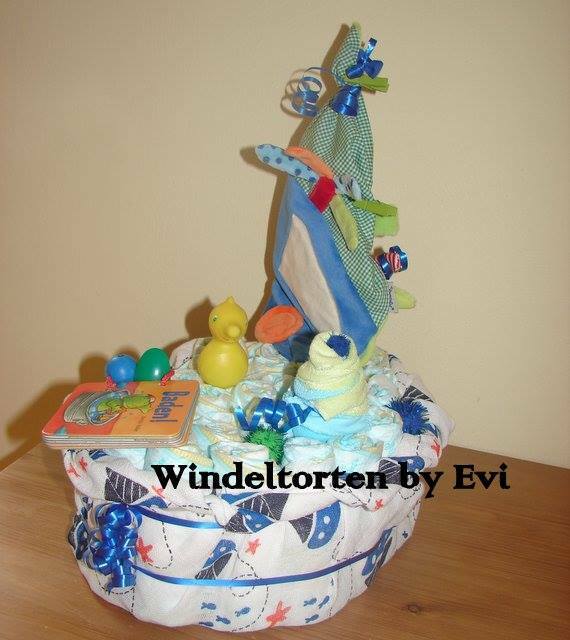 It is also cute to use just one overall theme / design such as ducks (baby towel with duck, rubber ducky, duck sponge, duck wash cloths, etc.). Want to have a little whimsical extra on your tub basket? Make a sail for it! Get some cardboard and a stick or a bath brush with a long shaft. Design the cardboard (a good means for personalization! ), fix it to your shaft and then stick your sail to the tub. Either use some adhesive tape or try to fix it between your items. Also want so simulate some bubbles and foam? Try crumbled up bubble wrap and cotton balls on top.